NICK: Gail expects 100 printed T-shirts tomorrow morning at Lassiter's. She's a professional and she'll expect a professional job from *me*. That means I've blown any chance I had of making money out of the gift shop. PAUL: I've actually booked the suite for us when *ours* comes round again. GAIL (muses): You were pretty sure of yourself, weren't you?! The two of them start kissing passionately – just as Des comes in! He looks away in embarrassment and Paul grins that he has pretty lousy timing! Des then announces that he won't be able to make it to the party this afternoon. Looking surprised, Paul comments that the Robinson Corporation wouldn't exist at all if Des hadn't backed them. Gail asks if something's wrong or if there's anything they can do. Des hesitates before then murmuring that it's just one of those things. With that he heads out, leaving Paul and Gail looking puzzled. JANE: It's weird when you fall in love. I mean, everything's so great: it feels like you couldn't possibly hurt anyone or hurt yourself. Everything's so straightforward. Is that growing-up, Mike? Realising there's no point in looking back? JANE: Mike... don't. Look, I wouldn't have got through this whole mess with Des without you. You're the best friend I've got. I don't want to mess up that friendship by playing games with memories. Mike sits there looking disappointed. JIM: Ladies, gentlemen and family... A man works hard setting up a business... raising a family.... You're proud of what you do – and you cover your mistakes! – but you're even prouder when your son achieves the sort of thing that we're here to celebrate today. JIM: You see, every father has this private nightmare: when your son's the head of this big corporation and you wake up one day to discover that the cheeky so-and-so's taken over *your* business! So this is by way of graft: congratulations, Paul, and take it easy on your old man, would you?! With that, he hands Paul a small box. Paul opens it to reveal a watch inscribed with ‘Robinson Corporation'. Henry, Nick and Sharon arrive, and Paul comments to Gail that he bets they're late because they've been working on the T-shirts. Nick tells Gail that the T-shirts are printed – but he mis-spelled a word: they're all spoilt. HELEN: Are you sure? ... Well no. ... Thank you. Thank you. Goodbye. HELEN: This is short, sharp and very disappointing – especially for *me*. Yesterday I received a ‘phone call from the Hong Kong solicitors handling Bess's estate. It was just a formality: they wanted to transfer the money into my account. PAUL (grins): I wish *I* could get disappointing ‘phone calls like that! HELEN: Yes, I'm about $130,000 poorer than I thought I was. Paul comments that Helen's already spent a lot of it. Helen nods that what she's spent will cancel out the amount she'll actually get, so there's almost nothing left. Todd asks if that means he won't get his bike. Jim and Beverly quickly warn him not to be selfish. Helen tells him sadly that he won't get his bike and Katie won't get a pony: she can't give *any* of them the things she promised. Todd asks Nick what *he* missed out on. NICK (sadly): Just a headstone for grandma's grave. With that, he gets up and walks off to his room, leaving everyone looking surprised at his selflessness. Helen hangs up the ‘phone after telling Lucy about her missing out on the money. Jim joins her and asks how *Hilary* took the news. Helen sighs that she'll still give her the money she said she would. Jim comments that that about cleans Helen out, doesn't it? Helen just replies that she thinks Hilary deserves the money more than *any* of them – although *Nick* nearly broke her heart this morning. Jamie knocks Des's open briefcase off the coffee table and onto the floor, just as Des dashes out of the bedroom area and catches him. Mike emerges from *his* room and tells Des that Bronny's on her way! Des asks Mike if he's nervous about the exam, but Mike replies that he isn't: he can't wait to get back to teaching. Changing the subject, he asks Des if he's had a blue with Paul, as he asked Paul why Des wasn't at the party and he seemed really short about it. Des just shrugs that he tried to make it but it couldn't be helped. Bronwyn arrives and Mike heads out. Bronwyn asks Des if it's all right if she leaves Jamie at the crèche for a while today, as there's something she's got to do. Des nods that that's all right. Bronwyn adds that she's been thinking of dropping back to part-time: Jamie needs to be with other kids, rather than being stuck with *her* all day. Des smiles that she's probably right. He adds that it's so hard to know where Jamie's up to: when you're on your own, you've got to make all these choices, and you spend half your time dithering and the other half wondering if you made a mistake. Bronwyn points out that he's *not* on his own: he's got Mike there. Des just replies that she knows what he means. HENRY: Space outside, a trestle table, some decent echoes and I'll get rid of those faulty T-shirts for you in 48 hours. GAIL (looking surprised): *Nick's* T-shirts? HENRY: Mm. At a profit. Henry pleads for a break and Gail gives in. Henry runs off again, excitedly! JIM: Why don't you go down and choose a headstone and let me pay for it? NICK: Thanks, but it's not right. JIM (insists): You're family – that *makes* it right; and if you feel like paying me back later when you're a bit more flush, that's up to you. Nick sits there looking thoughtful. DES: *Jane* was the reason. She'd rather not see me at the moment, and I don't much blame her. I would've said something yesterday, but I didn't think it was fair to involve mates. DES: Don't go ditching the Pacific Bank for some offshore mob when you become rich and famous! Henry and Bronwyn are selling the T-shirts outside the Waterhole. A businessman emerges from the pub and asks the two of them what they're doing. Henry tells him that Lassiter's is releasing a series of prints by exciting new Australian artists. He continues selling the ‘Nick Page originals', telling the man that the T-shirt is an investment. The man agrees to buy one for $10! Henry then spots Des, Gail and Paul approaching, and he tries to flog *them* some T-shirts! He then shows them how much money they've taken, leading Gail to suggest that he'd better tell Nick to get cracking on the *next* lot! Henry looks ecstatic! Gail then adds that he's back on at the Waterhole tomorrow. Henry lifts Bronwyn up and spins her around, exclaiming happily that he's got his job back! DO WE UNDERSTAND EACH OTHER???? Jim and Beverly arrive home and Jim says he'll put the kettle on. He looks at Helen, who's clearly miles away. 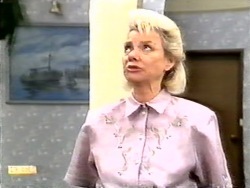 Beverly asks her if she's all right. 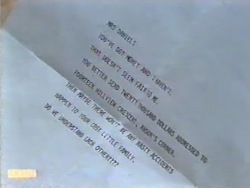 Jim comments in annoyance that it's those begging letters, and he asks Helen how much *this* one wants. JIM (exclaims): You've got to be kidding! Fancy asking for *that* much!